Rippedsheets is the premier provider of ID Labels on the Internet for Identification labels. Most of Rippedsheets.com sales of ID labels is directed to online sellers. Rippedsheets.com offers a variety of ID labels including child labels and asset labels. These can be diecut to any custom shape or size and custom printed. 110726 Washable Iron On Fabric - Clean Cut is printable on one-side only; this is the 110726 Washable Iron Fabric on a liner. The fabric is not micro-perforated but actually dies cut like labels on a sheet with no rough edges from perforations. Underwriters Laboratory verified for Child Safety under 12 years old. These materials have been tested, used and resold by many customers for 10 years with no problems adhering. 102270 Outdoor Indoor Satin Gloss White Polyester Perm is used for dishwasher safe labels. Underwriters Laboratory verified for Child Safety under 12 years old. These are great for bottles, sippy cups, and other similar needs. The 102190 Carpet and Washable Fabric Label has a very permanent adhesive and is used for shoe labels and other general purpose needs. Wristbands with variable data are a specialty with Rippedsheets.com. All wristbands are made completely in-house with fast turnaround to meet weekend event deadlines. 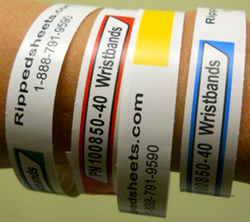 Rippedsheeets.com also inserts and encodes NFC and RFID into the non-laminated wristbands. Rippedsheets.com has a great selection of Asset Label and Tag materials in stock on the floor for customer orders with variable data. Some of the materials offered are brushed silver, gray polyester, matte gold, matte silver, and tamperproof. These labels can be finished with a sunscreen lamination, made into strips, and cut into singles. Rippedsheets.com makes custom back printed, and laminated polycarbonate graphic overlays for Nameplates and ID nameplates. Offered is a huge array of material choices to make variable data faceplates and graphic overlays including doming. Rippedsheets.com can adapt ID Labels for specialty applications including cryogenic labels, anti-microbial and other applications. This is just a few of the labeling options available from Rippedsheets.com. Contact the customer service specialists at 1-888-791-9590 or visit the website for more information.